Records of the Wurlitzer Company show that the organ was shipped to and installed in the Regal Theatre, Kingston-upon-Thames, in 1931. The Regal opened its doors to over 2,000 patrons on 15th February, 1932 one of the main attractions of the programme being Reginald Foort at the Wurlitzer. The pipework of the Organ was housed in two chambers above the auditorium and the console placed on a lift in the centre of the orchestra pit. A grand piano which could be played from the organ console could be sited either on the stage or together with the organ console in the orchestra pit. The organ was an immediate success and the B.B.C. soon began broadcasting from the theatre. The first record of the organ – played by Reginald Foort – was issued in 1932. After twelve months, Foort left and his position was taken over by Reginald New, who continued with the established broadcasting of the organ. All continued smoothly at the Regal until 1936, when the theatre was acquired by Union Cinemas and became the key theatre in their circuit. The cinema was then renamed the ‘Union’ and the console was completely altered. 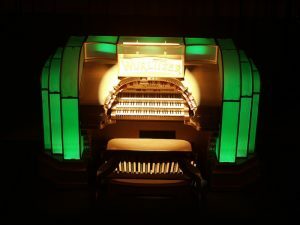 The console was given an illuminated surround – the ‘Jelly Mould’ – together with a Wurlitzer music rest. In 1951 Joseph Seal was appointed as Musical Director for the ABC chain of cinemas and in his expert hands the organ has been heard in countless broadcasts and on numerous recordings for many years. It was even heard in other ABC cinemas throughout the country as special interval and end-of-programme recordings were made with Joseph at the console. In October 1972, forty years after its arrival at Kingston, the organ was to move and become the largest exhibit in the Musical Museum, then housed in St George’s Church, Brentford, Middlesex. In 2006 the museum moved a hundred yards up the road to new purpose-built premises where the organ was rebuilt and re-installed in the new concert hall.